Prolonged exposure to isocyanates can render a painter permanently allergic to the dangerous chemicals — thereby ending their painting career for good, a Global Finishing Solutions trainer warned collision repairers Tuesday. 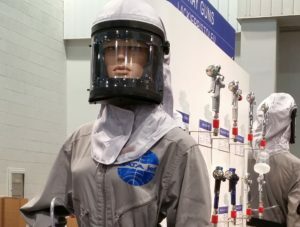 Given both that health risk and the chance of contaminants yielding costly refinishing flaws, painters can’t afford not to completely cover up their face and body, GFS auto refinish technical adviser Jason Garfoot said on a GFS-Auto Body Repair Network-Automechanika webinar Tuesday. “It’s important to always be safe,” he said. Even covering oneself isn’t enough if one’s “protective” material is porous enough to admit isocyanates. For example, it’s not enough enough to use lint-free gloves to protect the car, Garfoot said — use gloves which can protect your hands from isocyanate exposure. Regardless, light examination gloves definitely won’t keep “keep the isocyanates in the paint from getting into your hands,” Garfoot said. “I’ve seen a lot of painters go down for isocyanate poisoning,” he said. He compared the harmful substances to heavy metals and gave the analogy of the more well-known condition of mercury poisoning. “Your body can only take so many isocyanates,” Garfoot said, and eventually, a painter develops an allergy, also known as “sensitization,” after prolonged exposure. “Once you become allergic to them, your painting career is over,” Garfoot said. It’s possible a painter can go into anaphylactic shock by being near the substances, he said. Garfoot said that over the past year, he’s seen a handful of painters prematurely end their careers because of isocyanate exposure. “It’s not pretty,” he said. Wear a full-face mask and a full-body suit, Garfoot said. “It’s just gonna be better for you health-wise in the end,” he said. 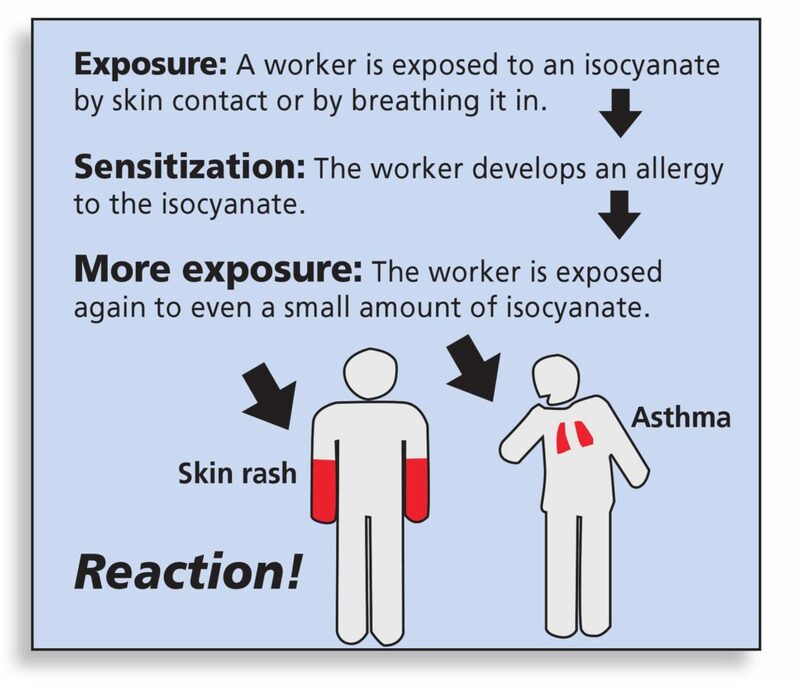 Isocyanates can enter the body through the face, skin, even the eyes, according to Garfoot. “You don’t have to breathe in paint for it to hurt you,” he said. Besides saving your health and career, full-body suits can save the painter and the owner money instead of tying up the booth with reworks. A partly exposed painter can slough off skin and dust onto the paint job, causing flaws in the paint that need to be resanded and reworked — delaying a piece-rate painter from earning money on a new job and affecting the owner’s cycle time by tying up the paint booth, according to Garfoot. You’ll still see painters refinishing a car wearing a short-sleeved shirt and work pants, Garfoot said. Garfoot recalled one instance where a shop kept encountering little blue marks on vehicles it was painting. He visited the stymied shop and painted using a full-body suit, and the results were great. An employee then painted the booth with less protection, and the blue returned. They cracked the case: The staff had just received new blue work shirts, and they were pilling off small blue fibers onto the paint jobs, according to Garfoot. Besides, once a painter gets used to wearing one, it “feels weird” to paint without being completely covered, he said. One more isocyanate tip: Make sure to clean filters. It’s possible that a clogged filter combined with positive pressure can push overspray out of the booth into the rest of the shop — where your colleagues aren’t protected at all.